EmeraldCraft Mod - This mod adds the ability to create a decorative Emerald ore blocks, new tools (full set), as well as the opportunity to do a full set of armor of Emerald ore. All tools and armor have the usual craft, so no big deal. Special Armor mod for MCPE 0.10.5This mod adds six new types of armor, each set gives you specific abilities, such as armor-time gives the ability to change the time, speeding it up. 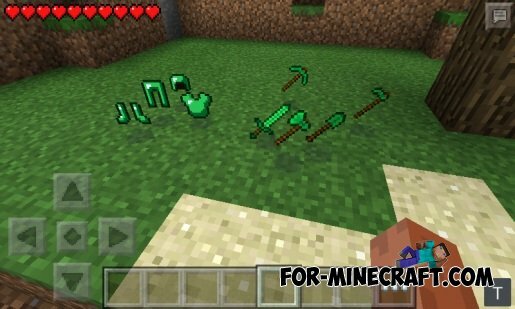 Emerald Tools and Armor mod for Minecraft PE 0.10.x/0.9.5Hello everyone! Today I'll show you a mod that will add to your world tools and armor of emeralds! Emerald Tools and Armor for Minecraft Pocket Edition 0.9.5.2Here's a script on the emerald tools and armor. This script was used for 0.8.1, but now he was transferred to 0.9.x! 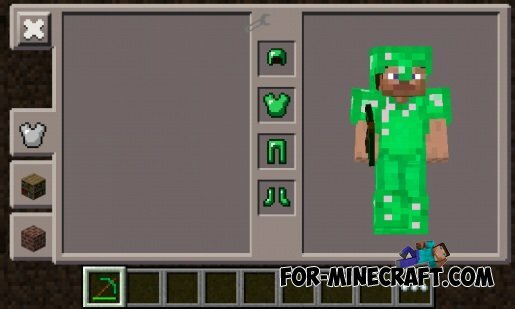 Emerald ToolsMod for Minecraft Pocket Edition 0.9.5.2With the help of a new modification of the player receives a unique opportunity to form armor and weapons of the emeralds.